ThinkPad loyalists will have to do without the traditional caps lock and function keys on the brand's newest laptop. At the International CES show in Las Vegas, Lenovo has been showing the latest model of its ThinkPad X1 Carbon device, a notebook that weighs less than 1.3 kilograms (3 pounds) and has nine hours of battery life. In making the laptop, Lenovo focused on creating a thinner and lighter device. It also streamlined the keyboard interface, removing the long series of physical function keys normally found at the top of a keyboard. In its place, the company's fitted a long "adaptive display," a touchscreen that can emulate different keys depending on the usage mode. This can include becoming function keys or buttons to toggle the PC's volume and brightness. A user can easily cycle among the different modes with the tap of an adjacent button. Another change is that Lenovo has removed the caps lock key on the new laptop. Instead, users simply double tap the shift key to go into caps lock mode. On Wednesday, Dilip Bhatia, general manager for the ThinkPad business unit, acknowledged that the new design features might not sit well with all fans of the laptop series. But Lenovo is confident the X1 Carbon's keyboard offers the best user experience. "We are very grateful to our loyalists. They have been buying our products for a number of years," he said an interview. "But at the same time, we also have to look at emerging trends." The ThinkPad brand, initially created by IBM and later acquired by Lenovo, has been around for more than 20 years, with its laptop keyboards hailed as some of the best in the market. However, those keyboards have evolved over the years. 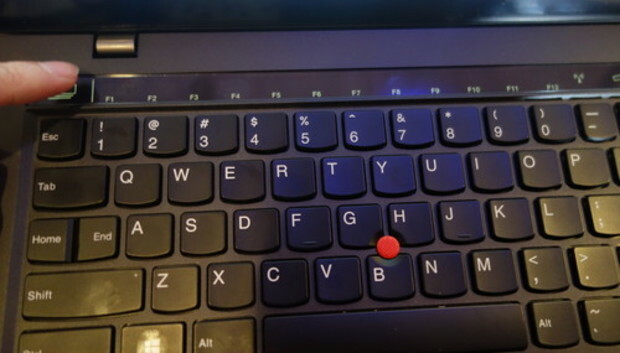 In 2012, Lenovo began replacing the classic square-ish keys with more curved "chiclet" buttons, a change that prompted some dismay among fans of the brand. "When we changed the keyboard, there was a lot of feedback from our loyalists, saying, 'Hey, what have you done? I want my old keyboard back,'" Bhatia said. But later industry reviews judged the new keyboards to be superior to the old, he added. Bhatia said he was personally proud of removing the caps lock button from the keyboard. Already, users are accustomed to double-clicking the virtual shift button on their tablets to go into caps lock mode. "You do that on tablets already, so we brought that same experience over here," he said. In addition to the keyboard changes, Lenovo has added several gesture controls to the X1 Carbon. With simple hand movements in front of the computer's webcam, a user can issue commands to the PC without touching the keyboard. For example, by placing an index finger over one's mouth, a user can signal the laptop to silence itself. Other motions include moving to different slides on a presentation with the swipe of a hand. In the future, the gesture controls will be integrated into other ThinkPad devices as the technology matures, Bhatia said. But the new keyboard design could end up being exclusive to the X1 Carbon, depending on user feedback. "If it really takes off, then we may consider putting it in other systems. But for now it's only in the X1 Carbon," he said. The new X1 Carbon will be available in late January, starting at US$1,299.